Forget the jokes about late '70s South Beach being the Yiddish-speaking section of "God's Waiting Room"; yes, upward of 20,000 elderly Jews made up nearly half of its population in those days--all crammed into an area of barely two square miles like a modern-day shtetl. But these New York transplants and Holocaust survivors all still had plenty of living, laughing and loving to do, as strikingly portrayed in Shtetl in the Sun, which features previously unseen photographs documenting South Beach's once-thriving and now-vanished Jewish community--a project that American photographer Andy Sweet (1953-82) began in 1977 after receiving his MFA from the University of Colorado at Boulder, and a driving passion until his tragic death. 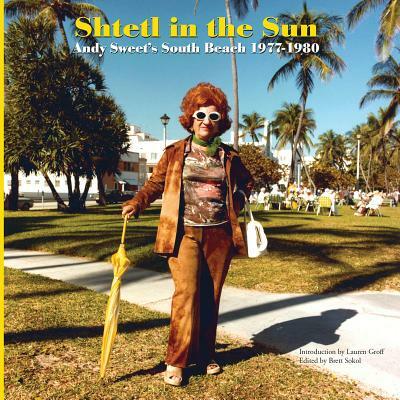 Sweet's photos capture this community's daily rhythms in all their beach-strolling, klezmer-dancing glory. "They were strong, humorous, and beautiful images," fellow photographer Mary Ellen Mark, who worked closely with Sweet, remarked after his death. The book includes a foreword by award-winning Miami arts journalist Brett Sokol and an introductory essay by National Book Award finalist and New York Times bestselling author Lauren Groff.